Click a flag below for general information about Nexus Expedition in Chinese, Mongolian, Kazak, Kyrgyz, Tajik, Uzbek, Turkmen, Persian and Arabic! Nexus Expedition began in February of 2005 at Knik Lake in Alaska. Dimitri Kieffer competed in the Iditarod Invitational Race, traveling 1,100 miles in 37 days by foot and snowshoe from Knik Lake to Nome. From this beginning, Dimitri would embark on a human-powered journey to circumnavigate the world, progressing intermittently, according to local visa restrictions and weather conditions. To this day, Dimitri has covered 24,215 kilometers (15,046 miles) from Anchorage, Alaska to Tala Bay, Aqaba (Jordan). 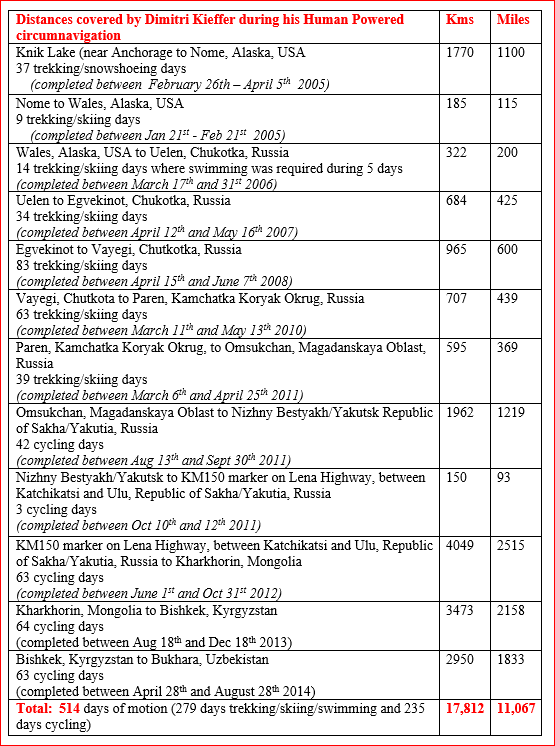 And since 2011, in company of his wife Gulnara Kieffer, cycling through Far Eastern Russia, Mongolia, China, Kazakhstan, Kyrgyzstan, Tajikistan, Uzbekistan, Turkmenistan, Iran, Oman and United Arab Emirates. While in Iran, Dimitri was able to secure all of the proper permissions from the Iranian and Omani authorities so that he could be allowed to swim and kayak across the Strait of Hormuz, which he accomplished in January 2016. Then, Dimitri and Gulnara cycled across Oman (Musandam Peninsula) and United Arab Emirates together. Afterwards, Dimitri cycled alone across the Kingdom of Saudi Arabia, (since Gulnara, as a female cyclist, was not able to receive a visa) and then entered Jordan.